Explaining Health Tests - Stunningly Sweet Standards L.L.C. vWD stands for vonWillebrands Disease. This is a common inherited bleeding disorder. In vonWillebrand's Disease, the dog is missing a substance in it's blood, which helps the platelets form clots. Because of the deficient clotting of blood, dogs with vonWillebrand's disease have excessive bleeding upon injury. This would be similar to hemophilia in humans. Bleeding generally occurs after a wound or surgery. A dog with vonWillebrand's disease may also develop nosebleeds, bleeding from the gums, in the stomach, intestines, or bladder. Testing a dogs DNA for this disease ensures he/she does not have or carry the gene for the disease. A simple DNA test via blood or cells will determine if the dog is affected. Sebaceous adenitis is an autoimmune/inflammatory skin disease that affects the skin glands of young and middle age dogs. 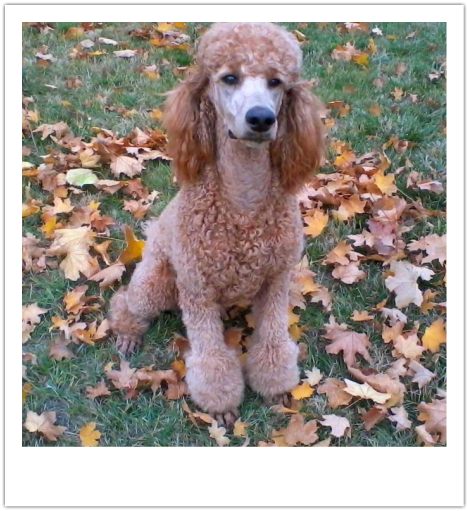 This condition most commonly affects Poodles, Akitas, and Samoyeds, although other breeds can also be infected. The exact cause of sebaceous adenitisis is unknown; researchers are currently studying the causes. This disease causes an immune response against the dog's own sebaceous glands (glands found in the hair follicles that make natural skin oils), and causes the glands to be damaged or destroyed. When this happens symptoms include: dull, brittle or coarse hair, intense itching, scaly/flaky skin, skin infection and large amounts of hair loss. If affected, this is a lifelong disease treated/assisted with oral medications. A simple skin punch biopsy of the dog sent to a dermatology labratory will determine if your dog is affected. COI under 6%. This dramatically reduces the risk of health complications and a constricted gene pool. AKC DNA is a sample of DNA (cells from inside the cheek) collected from the dog with a small bristle brush, and submitted to the AKC for testing. 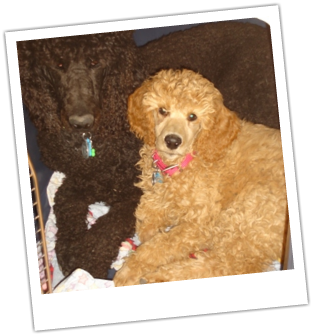 They test the sample to ensure that the dog claimed to be her Sire, is truly the Sire, and therefore this dog is 100% Standard Poodle, no other breeds found. The results come as several letters followed by a series of numbers and can be researched. Also, any purebred AKC stud dog that is used as a sire more than twice, is required by the AKC to have a DNA test and granted a DNA # before anymore litters can be registered under his name. 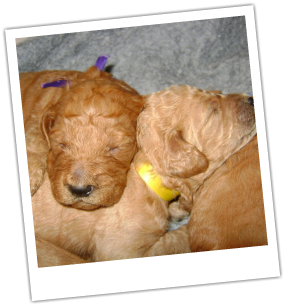 Sending a cheek cell sample to the AKC will determine your dogs AKC DNA number. The patella, aka the 'kneecap', rests in a groove in the end of the femur that allows the patella to glide up and down when the knee joint is bent back and forth. The patella also protects the knee joint. In some dogs, because of malformation due to bad genetics or trauma, the ridges forming the patellar groove are too-shallow and the patella will luxate (jump out of the groove) sideways. This causes the leg to 'lock up' with the foot held off the ground. The dog is forced to hold it's leg up and walk on the remaining 3 until the muscles relax and allow the patella to 'slip' back into normal position. The cry of pain is caused by the knee cap sliding across the bony ridges of the femur. Once out of position, the animal feels no discomfort and continues his activity but is only able to walk on 3 legs. Because of the strong genetic relationships, animals with this disorder should not be used for breeding. They can still be excellent pets- and those that do require surgery will usually lead perfectly normal lives without any restrictions on activity. 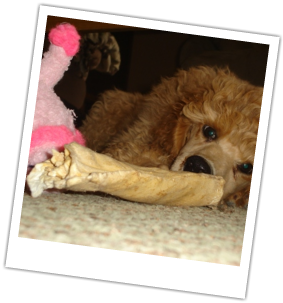 A simple physical exam of the knees by a veterinarian will determine if your dog has luxating patellas. Toys or Food? Decisions, decisions. CERF stands for Canine Eye Registration Foundation. CERF was founded by a group of concerned, purebred owner/breeders who recognized that the quality of their dog's lives were being affected by heritable eye diseases of the Lens and Retina. CERF was then established in conjunction with veterinary ophthalmologists, with the goal of eliminating all heritable eye diseases. An eye examination must be performed on your dog by a board certified veterinary opthamologist to be eligible for CERF certification. The veterinarian will detect and report any abnormalities, injuries or genetic issues and a certificate will be issued to you by the OFA via CERF. Mom, you don't mind if I sleep here tonight...do you? What is a Thyroid or T4 Test? A Thyroid test is a small sample of blood collected from the dog that tests the function of the thyroid gland. 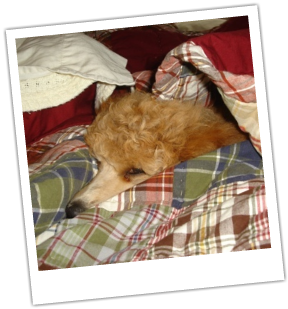 If the test comes up abnormal, it is almost always hypothyroid in dogs. Dogs are rarely hyperthyroid. Hypothyroidism is caused when the body is not making enough thyroid hormone, this causes weight gain, infertility, hair loss, pot belly, fatigue, lethargy, dry itchy skin, and a low heart rate. Testing the dog for a thyroid problem is simple and effective, using a smaple of blood, and reduces the risk of future pups to be affected. OFA stands for 'Orthopedic Foundation for Animals' . Credit for the formation of the OFA is generally attributed to John M. Olin. John Olin was an avid sportsman, hunter, and field trial participant. When hip dysplasia began to impact the performance of Olin’s dogs, he organized an initial meeting with representatives of the veterinary community to discuss means of limiting the disease. This ultimately led to the formation and incorporation of the OFA in 1966. Its initial mission: 'To provide radiographic evaluation, data management, and genetic counseling for canine hip dysplasia'. 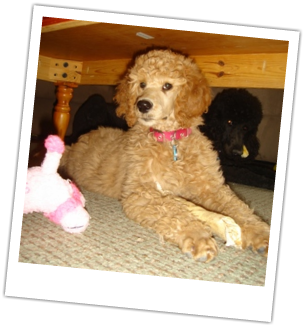 While the OFA continues to focus on hip dysplasia, today’s OFA Mission is, “To improve the health and well being of companion animals through a reduction in the incidence of genetic diseases,” this reflects the organization’s expansion into other inherited diseases. Testing hips and elbows through the OFA consists of your dog being brought to your local veterinarian, sedated for x-ray positioning, and several different x-rays are taken with the dog in several different positions for the OFA Veterinarian to be able to clearly view the Acetabulum (hip joint), Head of the Femur, and Humero-Radial-Ulnar Joint (elbow joint). Grading of hips/elbows fall into seven different categories. Those categories are "Normal" (which are grades of Excellent, Good and Fair), "Borderline", and "Dysplastic" (which are grades of Mild, Moderate, Severe) . 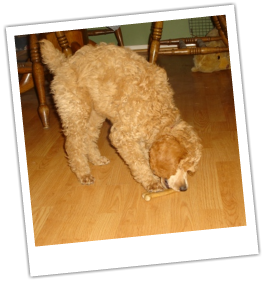 Once the OFA has recieved and evaluated a dogs hips and elbows via x-rays, they will mail out a results certificate which every breeder should have on hand and ready to show to potential owners on demand. Dogs with "Dysplastic" hips or elbows (which are rated Mild, Moderate or Severe), will display early signs of arthritis or hip dysplasia. This will cause your dog significant pain when rising, laying down, running, jumping, getting into the car or bed and any other activity. Some people describe it as 'they've aged before their time'. This can result in your dog prematurely being placed on NSAIDS (non-steroidal anti-innflamatory drugs) such as 'Rimadyl', 'Deramaxx', or 'Previcoxx' and sometimes in severe cases, it's coupled with a narcotic pain killer such as 'Tramadol'. In rare/severe cases a total hip or elbow replacement (same as in humans) may be suggested by your veterinarian. Dogs rated at ' 'Good' or 'Excellent' will have a much less likelyhood of having hip or elbow pain or problems and have an extremely high chance of passing on good/excellent hips and elbows to their offspring. This is the goal of all responsible breeders. Elbows: For elbow evaluations, there are no grades for a radiographically normal elbow. The only grades involved are for abnormal elbows. "I spilled spot remover on my dog. He's gone now."